190 Heaton Park Road – or 94 as it was until renumbering in 1904 – was a one off. The three-storey double-fronted half-timbered facade still distinguishes it from neighbouring houses. 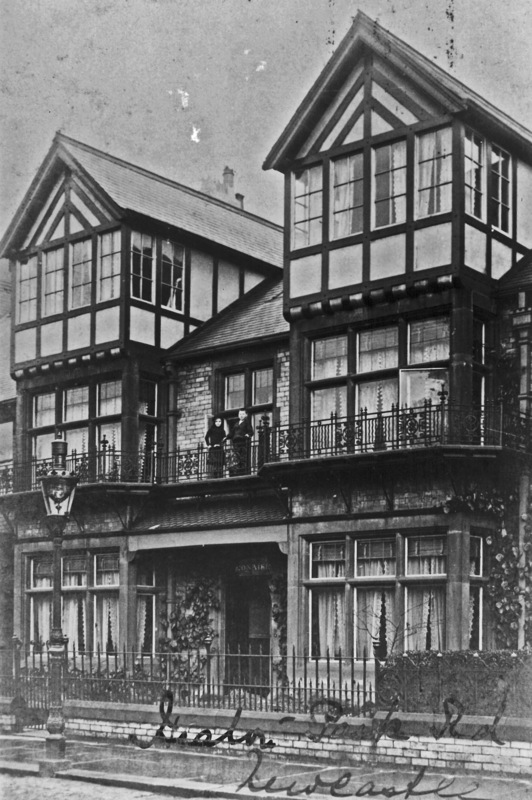 And the balcony and iron railings, as shown in the photograph below, which dates from around 1910, would have left nobody in any doubt about the status of its owner. The photo is reproduced with permission of Newcastle City Library. However, it was the interior which made it unique. 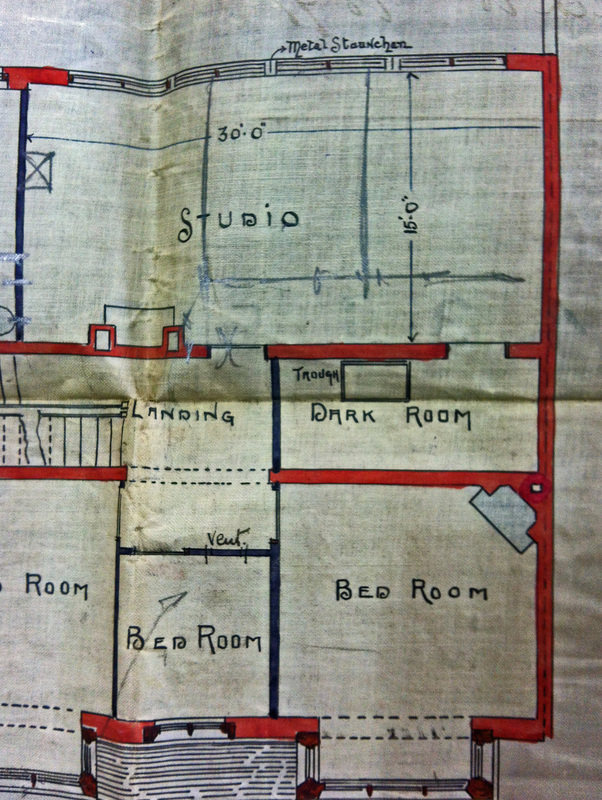 As you can see from these beautifully drawn plans, which can be viewed in Tyne and Wear Archives, it was designed for (or even by) Edward G Brewis and from the outset incorporated studios, a dark room and a print room among the usual living space. The exterior looks a little different from the photograph so either it was modified before being built or was altered later. Edward George Brewis was born in Gateshead, the youngest child of a publican and his wife. Even at the age of 17, on the family’s 1881 census return, he was described as a ‘photographic artist’. 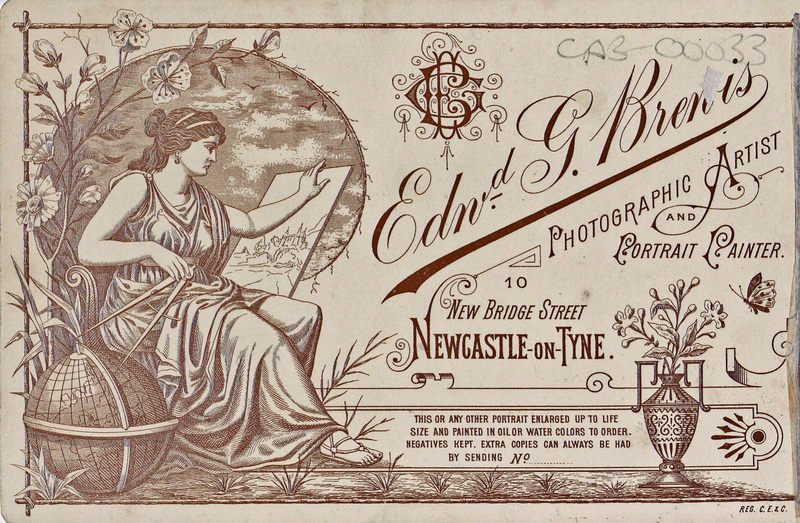 By 1890, by which time Edward was in his mid 20s, he was already running his own business at 10 New Bridge Street in Newcastle, premises which had previously belonged to the long-standing photography firm of Downey and Carver, the successor of the earlier partnership of W and D Downey. 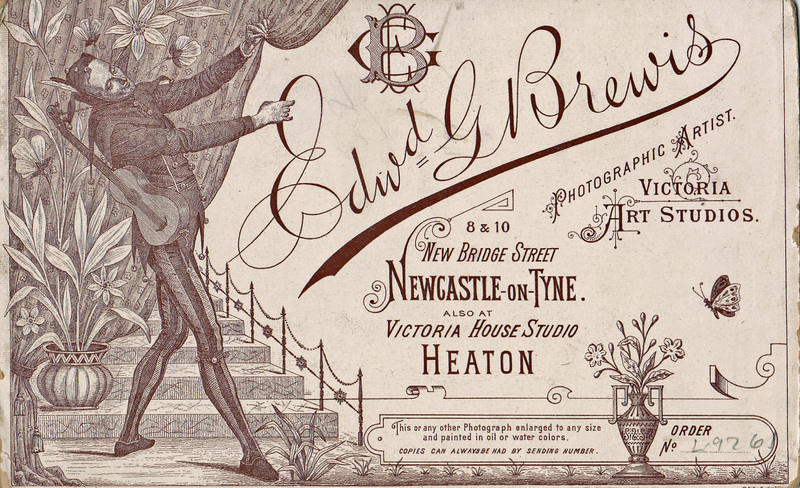 This was one of Newcastle’s oldest photography businesses (going back to the 1850s) so Brewis was continuing in a proud tradition. At this stage he was still living with his widowed mother. 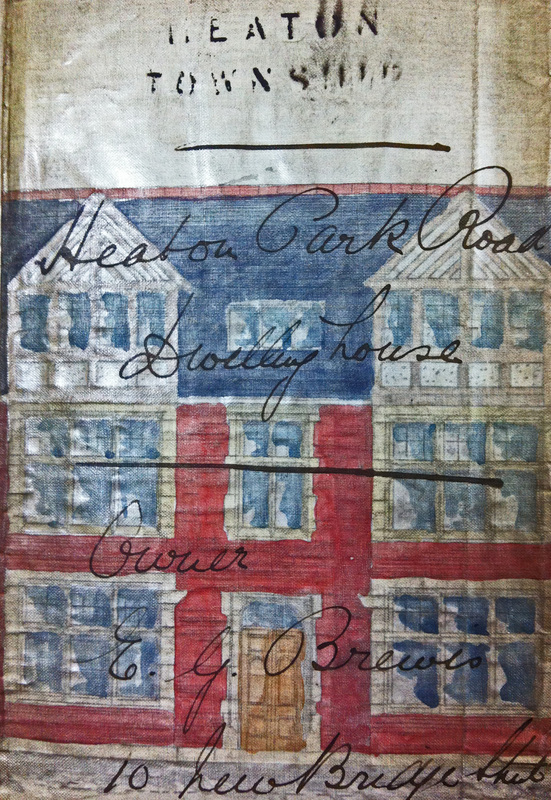 But just five years later, Edward was the proud owner of one of Heaton’s grandest houses and operating his business from newly expanded premises at both 8 and 10 New Bridge Street, which he called ‘Victoria Art Studios’, and the new ‘Victoria House Studio’ in Heaton. Brewis was primarily a portrait photographer although on his fantastic business cards reproduced below, he called himself variously a ‘photographic artist’ and ‘portrait painter’. He advertised that portraits could be enlarged to life size and painted in oil or water colour. Examples of his cabinet cards, which were so popular from the 1870s until well into the 20th century, can often be found on e-bay and in secondhand shops but the sitters are rarely identifiable. Check whether you have any Brewis portraits of family members in your attic – we’d love to see some. The only Brewis photographs of which we currently know the identity of the sitter are two of Heaton’s world champion cyclist, George Waller, on which Brewis hastily applied for copyright in July 1900. They are, as a result, held by the National Archives. One is reproduced here. The reasons for this and other links between Edward George Brewis and George William Waller will be explored in a future article. Both men left their mark on Heaton and its history. Amazingly Edward Brewis lived in his fantastic custom-built house for less than 5 years. By 1900, he was married with a daughter and living in Broomley near Bywell in the Tyne Valley. The young family moved house often at this time – from Stocksfield to Jesmond and then in 1906 to a house called ‘The Nook’ on Jesmond Park East in High Heaton. Their address at the time of Edward’s untimely death, in May 1908 at the age of 44, was in Warkworth but his business still operated from New Bridge Street. His success at a relatively young age was shown by the sum of over £12,000 he left in his will. The Edward Brewis photograph below of Eleanor Laverick nee Welford and was sent to us by her great granddaughter, Gillian Flatters. Daughter of William Welford (Master Shoemaker) and Mary Ann Anderson, Eleanor was born at 5 Stepney Terrace, Newcastle on 05/01/1854. She married George Laverick in Aug 1877. At this time they lived in Ryton. Later moving to Ernest Street, Jarrow and Harvey Street, Hebburn. After Georges death in Nov 1902 she moved to Lyon Street, Hebburn Quay, where she kept a shop until she died there on 30 July 1930. 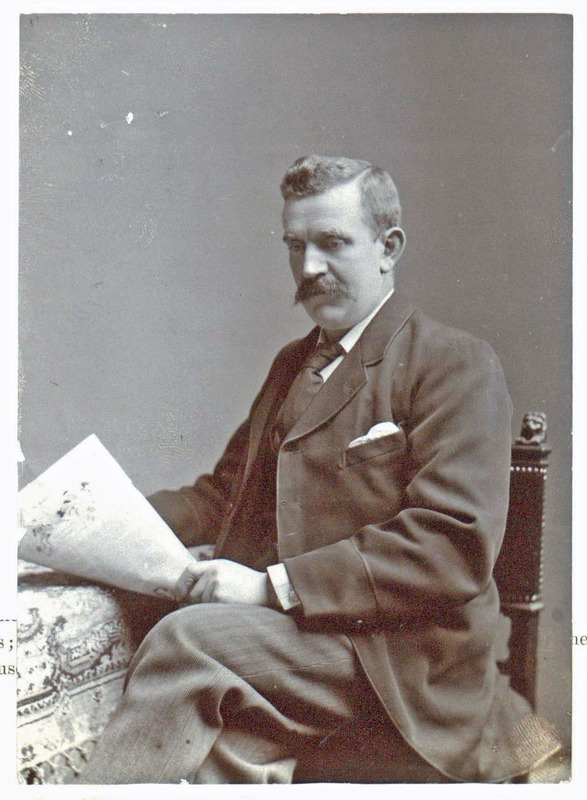 The above photograph was sent to us by Godfrey Duffy, who said that is a hand tinted colour photograph of his grandfather, John Duffy, taken in about 1895 at the Heaton Park Road studio. This entry was posted in Research and tagged artist, cyclist, Edward G Brewis, Eleanor Laverick, George W Waller, Heaton Park Road, High Heaton, Jesmond Park East, photographer, The Nook on November 24, 2013 by oldheaton.